An Enlightened balance of depth and accessibility that brings grand strategy into a new era. The developers of Europa Universalis IV set out with an ambitious goal: to make their Renaissance-era strategy flagship accessible and intuitive to newcomers without sacrificing the depth and breadth that existing fans of the series love. The end result of this expedition is not only spectacular, but unlike the similarly ambitious explorers and colonists it portrays, it's not going to give anyone smallpox. Starting in 1444, EU IV gives the player the opportunity to select any significant nation on Earth, shepherding it through to 1821 amid war, dynastic politics, scientific advances, and the discovery of the New World. Par for the course with a Paradox Development Studio game, there is a lot going on. Values like Naval Tradition and Trade Steering will continue to cause head-scratching among the uninitiated. But just as your nation's ruler can employ advisers to make up for deficiencies, EU IV has provided a peerless ally to aid your transition to world conqueror. This confidant is the game's interface, which is representative of how far the studio has come from even newer titles like Crusader Kings II. All of the information you need is presented cleanly, elegantly, and with (mostly) idiot-proof tooltips. The star of the show is a new, context-sensitive hint system which can explain to you in plain, "I don't play these games very often" English why your army upkeep is currently costing 10 bajillion gold more than it should, and why something called “Bogomilist Heretics” are a few battles away from taking over your government. All of the menus you need to get to are easy to find—and easy to decode. Every action you need to take has a big, clearly-labeled button. Important information is shown in large, color-coded boxes and pop-ups that can easily be interpreted at a glance: Green is fine, yellow means you might want to take a look at it, and red means you failed your people, and should feel bad. The interface isn't the only thing that's cleaner, more aesthetically-pleasing, and easier to read. Europa IV's world map is rendered with vibrant detail, complete with changing seasons, animated trade routes, and detailed military unit models. It's the studio's first game that looks and feels truly modern, and the visuals are impressive enough that I found myself mostly playing in the raw terrain view, rather than with one of the game's informational overlays permanently toggled on. Europa IV offers a number of different paths to glory, though as with previous games, your success is measured by a score given at the end instead of a Civilization-style, campaign-ending victory condition. Military conquest, diplomatic scheming, and colonization are all viable paths, but the proverbial da Vinci in residence is the new Trade system. Trade is based around the idea of nodes—specified regions in which nations compete for a share of a fluctuating pot of trade income—and routes by which trade flows from one node to the next. As a trading nation, you will use special characters called Merchants to either collect money from a trade node in your territory, or steer trade from a further one into your home node. Here's how I described it to another player in multiplayer: You can either take money out of the money bucket, or tip money from the other buckets into your money bucket. Once the New World is colonized, this system allows you to chain-dump money back to your European base of operations for huge profits, intuitively modeling how trade would have actually worked in this era. It all comes together into an elegant dynamic that offers a play style all its own. Like much of EU IV, it is easy to dabble in, but complicated to master. Things work similarly if your base of operations isn't in Europe, but not identically. While you can play as civilizations such as the Aztec Empire, the game is clearly designed to focus on the European powers (which is probably why they didn't call it Every Country is Equally Viable Universalis). Nothing is stopping the Aztecs from taking over the world, but before the Spanish show up with guns, their progress through the tech tree is extremely sluggish. And after the Spanish show up with guns, they often find themselves shot to death. Truly a dilemma worthy of an experienced player's time, but not a campaign with the same richness as playing, say, those gun-toting Spaniards. The colored blobs on Europa IV's world map are divided into tiers, with some (France, Russia, The Ottomans) getting a lot of developer attention, in the form of unique abilities, and hand-tailored historical events and missions. The rest fall into a continuum, with the lowest-tier countries having unique cultural unit graphics, but generic stand-ins for almost everything else. The variety of playable nations is still huge—even if you only select from the ones that got the most design love—but don't expect every start location on the map to offer the same level of flavor and polish. Warfare, while still not a strong point of Paradox's grand strategy formula, has also seen some much-needed improvements. AI armies are far smarter, in general, than in previous titles. They will now form “hunter-killer” forces to seek and destroy your weaker detachments, and have been trained to avoid some common traps that players had come to rely on. Changes to the way morale works have also prevented wars from being decided in one battle of the mega-stacks, followed by the victorious army chasing the defeated one for a year and a half until the latter is completely overrun. EU IV also offers the most headache-free multiplayer experience of any title Paradox Development Studio has ever released. Online play now uses Steam as a backbone, as opposed to the iffy metaserver from previous games. This allows players to “hotjoin” in the middle of a session without having to save and re-host the game. It's still not perfect, and I ran into a few bizarre issues with things like troop numbers becoming out of sync. But overall, dropped players and crashes, commonplace in Crusader Kings and Victoria II, are refreshingly rare. Europa Universalis IV is a masterwork of a strategy game. It still has its rough edges, and convoluted underlying systems that will only be comprehensible to the most in-depth and experienced players. But never before has the core gameplay been so accessible to a total grand strategy newbie. At any given time, you can get as much or as little help as you need from the interface regarding what you should be focusing on. PDS has demonstrated a precise understanding of what turned some potential world conquerors off of its previous forays, and proven its ability to improve on the formula in the right directions with the finesse of a true veteran studio. 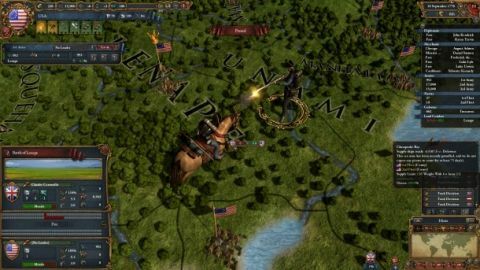 The result of these efforts is a textured and engrossing simulation that conquers the common ground between your average Civilization V player and the long-time devotees of grand strategy. Never before have I felt that "World at your fingertips" feeling as strongly, and you owe it to your sense of discovery to give EU IV an hour of your life or two (hundred). Order in tonight. You have a world to dominate.